November was Diabetes Awareness Month. The diabetes community joined together, wearing blue every Friday for diabetes awareness in addition to World Diabetes Day (14 November). Have you ever paid attention to what color people are wearing on any given day? My children play a game where they search out yellow cars. You don't realize how uncommon yellow cars are until you've played this game. The opposite was true for me on November 4, the first of the Blue Fridays. Everywhere I looked, I saw people wearing blue. Blue dress shirts, blue t-shirts, blue scrubs, blue sweaters, blue jeans. I actually felt a sense of pride. Were all of these people wearing blue in honor of all the people living with diabetes? I was just about to ask two women who were sitting together at lunch, both wearing blue, if they knew about Blue Fridays. Then reality hit. 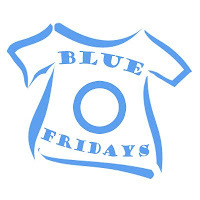 It was highly doubtful that they would know about Blue Fridays. Afterall this was a movement started by the DOC, not mainstream media. Should I have told them about Blue Fridays? Maybe a little flyer to hand out, educating people? That would be easier, perhaps. I would welcome ideas for spreading the word to the general public.